Rajinikanth is almost considered as a God especially when it comes to his huge fan following down South. Rajinikanth was born as Shivaji Rao Gaekwad. Superstar Rajinikanth is way more than just an actor – he is almost considered as a God especially when it comes to his huge fan following down South. Rajinikanth was born as Shivaji Rao Gaekwad on December 12, 1950 in a Marathi family in Bangalore. He was named after the Maratha warrior, Chhatrapati Shivaji. Rajinikanth was the fourth child of Jijabai and Ramojirao Gaekwad, who was a police constable. In the initial years of his childhood and youth, he struggled a lot due to financial issues. Though he came from a Marathi background, Rajinikanth has not acted in any Marathi films as yet. At the start of his career, he took up a number of odd jobs including being a carpenter and a coolie. He was later employed by Bangalore Transport Service (BTS), where he worked as a bus conductor. He then began to take part in stage plays. He was also offered a part in playwright Topi Muniappa’s mythological plays. It was during this time that he came across an advert for acting classes at the Madras Film Institute and decided to join against the wishes of his family. His friend and co-worker Raj Bahadur supported him financially during his course. During one of his onstage performances at the institute,Tamil film director K Balachander noticed him and advised him to learn Tamil, which Rajinikanth followed without delay. He made his debut in Tamil cinema with ‘Apoorva Raagangal’ (1975), where he played a supporting role of an abusive husband opposite Srividya. The movie was well received and went on to win three National Awards. The following year he forayed into Kannada films with ‘Katha Sangama’, directed by Puttanna Kanagal. Director S. P. Muthuraman revamped Rajinikanth’s onscreen image entirely and first experimented with him in ‘Bhuvana Oru Kelvikkuri’ (1977) in a slightly negative role in the first half of he film and later as a protagonist. Soon after, J. Mahendran’s ‘Mullum Malarum’ established Rajinikanth in Tamil cinema. Banking in on the success of ‘Bhuvana Oru Kelvikkuri’, Muthuraman made melodrama ‘Aarilirunthu Arubathu Varai’, where Rajinikanth played a hero who sacrifices everything for his siblings. This was the turning point in his career, where he went from an actor to a performer who not only enthralled his audience but moved them to tears. Between 1975 to 1977, Rajinikanth took up a number of villainous roles in films like ‘16 Vayadhinilae’, ‘Moondru Mudichu’ and ‘Avargal’. Towards the end of the 80s, Rajinikanth had gained immense popularity down South. He suddenly decided to take a break and quit acting, but was coaxed back. He made a comeback with ‘Billa’, which was remake of Bollywood film, ‘Don’. His double role made the film a huge commercial success. ‘Billa’ was followed by a row of hits like ‘Murattukaalai’, ‘Pokkiri Raja’, ‘Thanikattu Raja’, ‘Naan Mahaan Alla’, ‘Pudukavithai’ and Moondru Mugam. K. Balachander’s first home production, ‘Netrikan’ proved to be yet another milestone in Rajinikanth’s career. Some of his hits in the 80s included ‘Padikkathavan’, ‘Thee’, ‘Velaikaran’, ‘Dharmathin Thalaivan’, ‘Mr. Bharath’, and ‘Maaveeran’. His 100th film ‘Sri Raghavendra’ saw him playing the Hindu Saint Raghavendra Swami. In 1983, Rajinikanth made his Bollywood debut with ‘Andha Kanoon’ along with Amitabh Bachchan and Hema Malini. The film was well received and went on to become the highest-grossing film at that time. 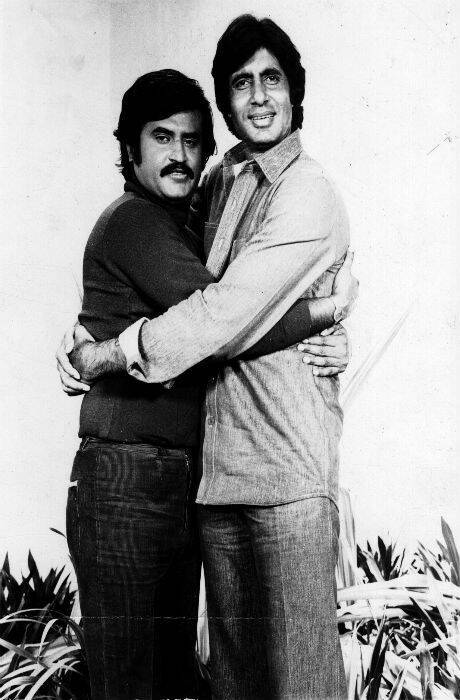 Since their first film together, Rajinikanth and Amitabh Bachchan have shared a great friendship and worked together in Hindi films such as ‘Geraftaar’ and ‘Hum’. During the 90s, Rajinikanth had the most number of successful releases – ‘Thalapathy’, ‘Mannan’, ‘Annamalai’, ‘Uzhaippali’, ‘Veera’, ‘Baasha’, ‘Muthu’, ‘Arunachalam’ and ‘Padayappa’. Bollywood flick ‘Hum’ in 1991 saw him appear as the second main lead along with Amitabh Bachchan. In 1991, he worked with Mani Ratnam in ‘Thalapathi’, which was heavily inspired by the Mahabharata.He wrote his first screenplay ‘Valli’ and also acted in it in 1993, but it failed at the Box office. ‘Basha’ went on to become a huge blockbuster and gained cult status, making him a demigod to his fans and followers. His film ‘Muthu’ was the first Tamil film to be dubbed into Japanese as ‘Muthu: The Dancing Maharajah’ became very popular in Japan. But it was his 150th film, ‘Padayappa’ that became the grandest success in his acting career. He then took a sabbatical of almost three years, after which he starred in his home production, ‘Baba’, which released on August 15, 2002 amidst much fanfare and extreme hype. However, the film failed to live up to the expectations of his fans due to a weak script, which was written by Rajinikanth himself. This was Rajinikanth’s second failure as a screenwriter after ‘Valli’. Though the film covered its budget, it was considered a huge loss when compared to his other work. After the disappointment with ‘Baba’, Rajinikanth considered retiring from films and showed interest in politics for a while. He later went over many scripts and discussed various projects with different directors. He finally appeared in P. Vasu’s Tamil remake of ‘Manichithrathazhu’, ‘Chandramukhi’, which is said to be his comeback film. Releasing on April 14, 2005, the film broke all his previous Box office records and became a smashing hit. This was followed by yet another blockbuster, ‘Sivaji: The Boss’, which released on June 15, 2007 after two whole years of filming and production. Sivaji became the first Tamil movie to be charted as one of the top-10 best films of United Kingdom and South Africa Box-Offices upon release. Rajinikanth then worked in P. Vasu’s ‘Kuselan’, a remake of the Malayalam film ‘Kadha Parayumbol’. The actor did a cameo in the film, however, it performed very poorly at the Box Office. In 2010, Rajinikanth teamed up with director Shankar once again for techno thriller ‘Endhiran’ which also starred Aishwarya Rai Bachchan and Danny Denzongpa. The film was said to be the most expensive Indian film ever made and became the highest-grossing film in the country at the time. Rajinikanth’s next release, ‘Kochadaiiyaan’, was announced in November 2011. Directed by the superstar’s daughter Soundarya, the film is said to be the first of its kind in the country and expectations are sky-high, especially since its release has been postponed more than just a few times. And this will be his comeback film after a long hiatus of almost three years. When it comes to award and accolades, Rajinikanth has won more than his fair share. He has won six Tamil Nadu State Film Awards – four Best Actor Awards and two Special Awards for Best Actor – and a Filmfare Best Tamil Actor Award. He is also a recipient of the Padma Bhushan, India’s third highest civilian honour.